In appreciation for the years of patience that fans have shown since Thief was first announced as a current-gen release (titled Thi4f) back in 2009, Eidos Montreal has released an unbelievably exciting teaser trailer ahead of a the game’s debut trailer next week. 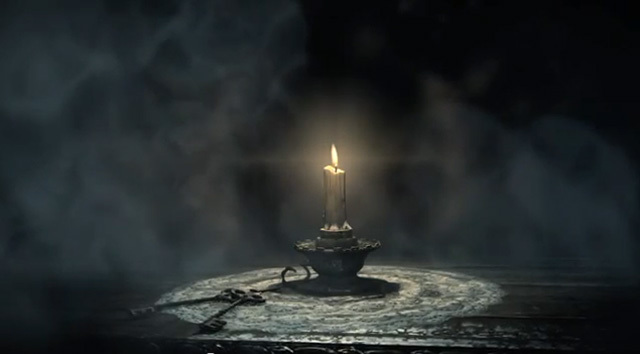 The almost 30 second teaser, which is said to have been made using in-engine footage from Thief, opens with a lit candle sitting on a small table in a dark room. There is also a set of skeleton keys on the table, lots of swirling smoke, some dramatic music… and the color black. Then, from out of the darkness, Garrett’s hand suddenly appears, moves quickly towards the lit candle and pinches out the flame! Where a normal person would have simply blown out the candle, and the old Garrett would have used a water arrow, this teaser clearly shows that the rebooted Thief game tells the tale of a man unconcerned with minor burns — not to mention the potential nerve damage that might be caused to his fingers. Additionally, we can now say for certain that the decision to push Thief back to the next generation of consoles was definitely worth the long wait. The superior candle snuffing gameplay mechanic shown in the teaser trailer is clearly far too sophisticated for either the Xbox 360 or PlayStation 3. As you watch the thrilling Thief in-game teaser trailer below, keep in mind that this is just the tip of a very big iceberg. Eidos Montreal has promised that the debut trailer, which is going to be released on April 2nd, will feature much more footage from the actual game. Who knows? Maybe we will even see Garrett pull off a double-handed simultaneous two candle snuff! We will keep an eye out for the next Thief trailer and let you know as soon as it is released. In the meantime, make sure to let us know how excited you are about the current teaser down in the comments.